Bloor-Yorkville Icefest 2019: Hollywood North is Set to Dazzle! We are excited to announce the final details of Bloor-Yorkville Icefest 2019: Hollywood North. This marks our 14th year executing this event in support of the Heart & Stroke Foundation. 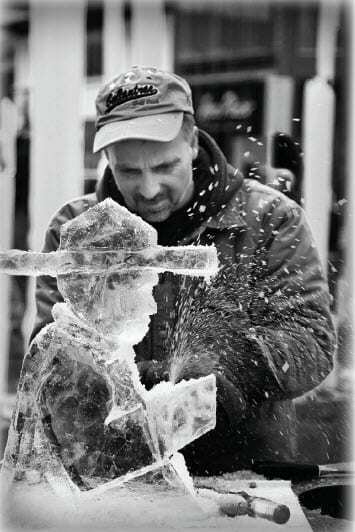 Icefest invites members of the community to celebrate winter as we come together to witness the transformation of the Village of Yorkville Park and surrounding areas into a magical display of ice sculptures. This year, we have added new initiatives to our programming, including an expanded DJ Lounge with multiple seating options, mobile phone charging stations, and a photo booth. Additionally, we have a heated area in the park featuring Muskoka-style chairs with fleece blankets, and an outdoor cocktail patio at Sassafraz featuring Icefest-themed cocktails. The annual Sassafraz Ice Carving Competition is an exciting kick-off to the weekend! 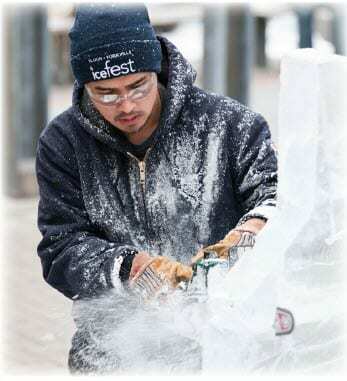 Beginning at 12 pm on February 9th, the competition takes over the east side of the Village of Yorkville Park, as great masterpieces begin to emerge from beneath the picks, chisels and even chainsaws of talented carvers. Cast your vote for your favourite sculpture between 2 pm and 5 pm at the Bloor-Yorkville BIA Tent on Bellair Street. Once you vote, you can enter to win a Bloor-Yorkville Prize Package starting at 12 pm. Two Toronto Maple Leaf’s Tickets from 11 YORKVILLE / METROPIA, 11 Yorkville Ave, (Value: $319). Four VIP Passes to THE ROM, 100 Queens Park, (Value: $182). $100 Gift Certificate from KITCHEN STUFF PLUS, 773 Yonge St.
$50 Gift Certificate from CAROLE’S CHEESECAKE, 114 Cumberland St. Located within the Park of Yorkville Village is a unique outdoor warm-up station! With Muskoka-style chairs, heat lamps, and Icefest blankets, this is the ultimate way to lounge in the great Canadian winter! 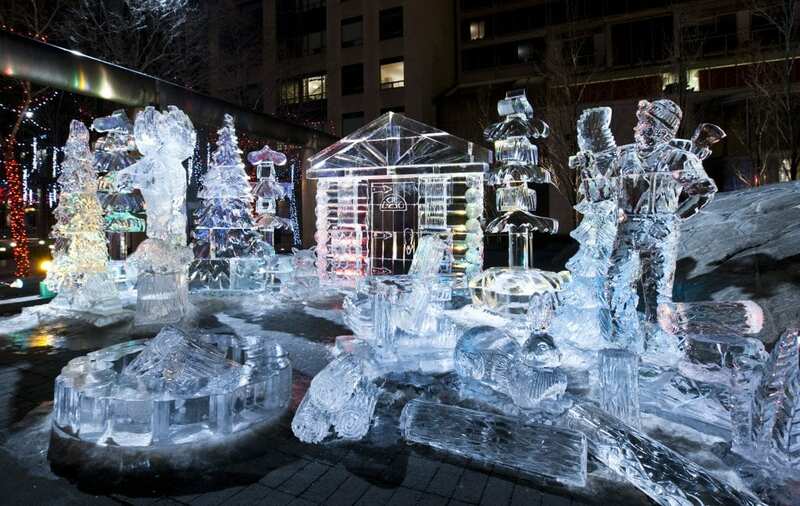 Enjoy a moment with your friends to relax and take in the glittering ice sculptures. Make a toast to winter on the Sassafraz outdoor patio. Featuring three Icefest-themed cocktails, this is another great way to enjoy the ambiance of the Hollywood North-themed neighborhood. You can also make a stop at the Icefest Lounge to charge your phone, take a selfie at the Photo Booth, and enjoy the music from the DJs at Bellosound. Another new and welcome addition to our programming this year is the Flight Centre Scavenger Hunt. Not only will this activity remind you of your youth, but the prize is a $1000 gift voucher towards a Better Beach Vacation. Visit the Bloor-Yorkville BIA tent on-site at Icefest to pick up your ballot! Please visit the Icefest website for all additional information! We can’t wait to see you at Bloor-Yorkville Icefest 2019: Hollywood North.